The US is claiming the North Korean rocket launch is a smokescreen for long-range missile tests. NEW SATELLITE IMAGES of a North Korean rocket launch site show a mobile radar trailer and rows of what appear to be empty fuel and oxidizer tanks, evidence of ramped-up preparation for what Washington calls a cover for a long-range missile test. An analysis of images provided Monday to The Associated Press by the US-Korea Institute at Johns Hopkins School of Advanced International Studies shows Pyongyang “has undertaken more extensive preparations for its planned April rocket launch than previously understood.” The images were taken Wednesday. A mobile radar trailer essential for any launch stands at the end of a new dirt road running from the entrance of the Tongchang-ri site; it has a dish antenna that’s probably a radar tracking system, according to the institute’s analysis. Radar tracking during a launch gives engineers crucial real-time information on the performance of the rocket’s engines, guidance system and other details. 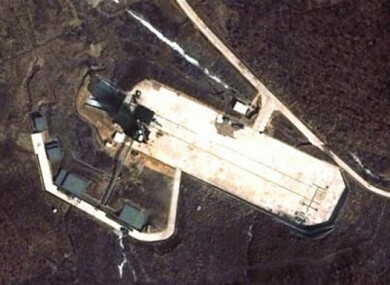 “These pictures are new and important evidence that the North’s preparations for its rocket launch are progressing according to schedule,” said Joel Wit, visiting fellow at the institute and editor of its website on North Korea, “38 North.” The images are from Digital Globe, a commercial satellite photography company. North Korea says the launch, set for sometime between April 12 and 16, will fire a satellite into orbit to study the country’s crops and natural resources. It is also meant to honour one of the country’s most important days — the centennial of the April 15 birth of national founder Kim Il Sung. Washington says North Korea uses such launches to test missile systems for nuclear weapons that could target the United States. While North Korea has conducted two nuclear tests, analysts don’t believe it has yet mastered the technology needed to shrink a nuclear weapon and mount it onto a missile. Any launch would be the end of a February 29 accord between North Korea and the United States that would ship US food aid to the impoverished North in exchange for a moratorium on missile and nuclear tests, as well as a suspension of nuclear work at its main Yongbyon nuclear facility. The US says plans to provide food to the North are already on hold. The launch would be the fourth of its kind since 1998, when Pyongyang sent a long-range rocket hurtling over Japan. The last rocket launch, in 2009, led to UN condemnation and the North walking away from six-nation nuclear disarmament talks; weeks later, Pyongyang carried out its second nuclear test. The planned launch could demonstrate if North Korea is closer to perfecting a multistage rocket that could hit the United States. Analysts fear a new launch could spur a chain of events that would mirror 2009 and send tensions soaring again on the Korean peninsula. A year after the last test, 50 South Koreans were killed in attacks blamed on North Korea. The new satellite images show what are likely empty fuel and oxidizer tanks in previously empty, fenced-in areas, the institute’s analysis says. The announcement of the latest launch came just two weeks after the US-North Korean nuclear-freeze-for-aid agreement, which had buoyed hopes for improved relations between the wartime enemies under new North Korean leader Kim Jong Un. He came to power after his father Kim Jong Il died of a heart attack in December. North Korea’s ruling party announced Monday that it will hold an important political conference April 11 in Pyongyang. Kim Jong Un is expected to gain new titles at the conference, which comes shortly before the planned launch. The North’s new Tongchang-ri rocket launch site is about 55 kilometres from the Chinese border city of Dandong. North Korea has said that the southerly flight path from the site was chosen so debris wouldn’t hurt neighbouring countries. But there has been widespread fear over falling debris from the rocket. Japan’s defense minister has ordered missile units to intercept the rocket if it or its fragments threaten to hit Japan. Seoul has also warned it might shoot down any parts of the North Korean rocket heading for South Korean territory. South Korean defense officials have said the main body of the three-stage rocket was transported to a building in Tongchang-ri. Email “Satellite images show North Korea launch operations”. Feedback on “Satellite images show North Korea launch operations”.